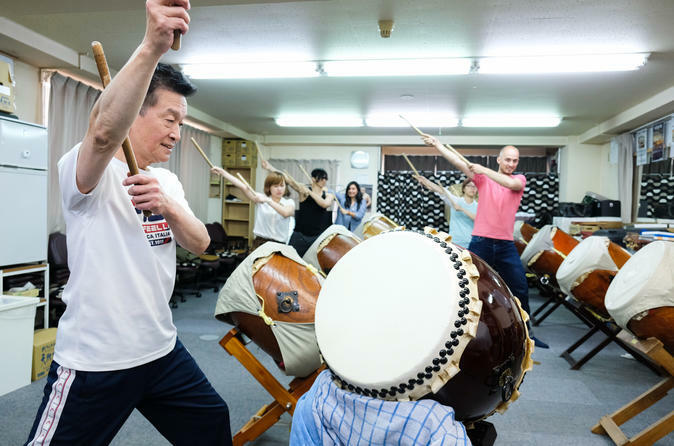 The Japanese Taiko drums were once a local and religious instrument used during festivals and ceremonies in Japan but it has now risen to international fame. Discover the art of drumming in style with members of one of the few groups that are touring abroad. Listen to a private concert closer than anybody else and feel the powerful vibration through your bones. Our host is a passionate drummer, an owner of numerous variety of drums, who has been teaching celebrities, such as The Black Eyed Peas! You will have the chance to enjoy an hour-long private lesson with some of the best of the field. Take the first steps toward drumming awesomeness! We will meet up near Ryogoku Station and then transfer to the destination by train. The place you will be visiting is near the Ryogoku Station. Upon arrival, you will be greeted by the drum master and he will be your guide for the day. There will be a translator to help you communicate so that you can focus on the experience and not the language barrier. Taiko or wadaiko, a Japanese drum, is a traditional instrument that is used for festivals since a long time ago. It makes a strong sound and rhythms that excite people. For this trip, you can learn how to play wadaiko directly from a master who has been playing it for more than 40 years! Spend some time practicing the Japanese drum while chatting and learning more about this unique Japanese instrument from the master. After the experience is over, you will be transferred back to departure location to conclude your tour. *The departure time and place of your tour may change. Please refer to the booking confirmation and Tour Detail email that you will receive after booking.